A bona fide piece of musical history. The news that Theatre Of Tragedy were to call it a day was a great shock to many. Often cited as the instigator of the metal female voices genre and certainly one of its most innovative acts, the band from Stavanger, Norway shone more brightly in fifteen years than some acts can achieve in twice that lifespan, and 'Last Curtain Call' is a fitting testament to such a truly great band. Even as a last hurrah, this release almost never got off the ground. Just when it looked like everything was sorted the band had to post on their website that the financial side of the project had been 're-evaluated' and that as a result (and even with the band stumping up €10,000 themselves) as late as early September fans' contributions had to be solicited to raise the necessary cash to pull it off. Thankfully, sufficient capital was raised and the band's final show in their hometown on 2nd October 2010 was captured for posterity. As this was a staged event, 'Last Curtain Call' is more of a greatest hits package than a record of the 'Forever Is The World' tour, and the tracklisting skips merrily across the band's history – although is bookended by the opening and closing cuts (the malevolent 'Hide And Seek' and the haunting 'Forever Is The World') of that swansong studio album. Highlights? There are sixteen of them, spread (rather sparingly, unfortunately, as the set isn't much over a single disc in length) over two CDs. You can pick any song and revel in its uniqueness, although 'Storm' is great for a bounce around the room and I am a sucker for the aforementioned 'Hide And Seek'. 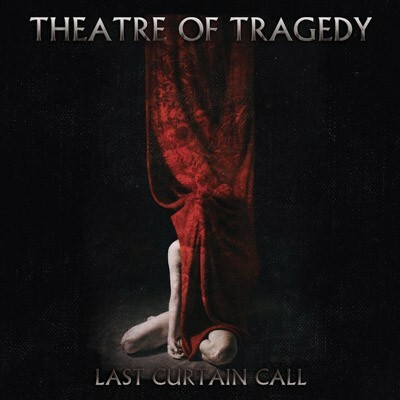 Theatre Of Tragedy were a yardstick by which every other band in this genre were measured, and 'Last Curtain Call' is a bona fide piece of musical history. The real kicker was that 'Forever Is The World' hinted at new beginnings, but instead the band decided to quit while they were ahead. A shame, it's true, but it is better to burn out than fade away, and the band had obviously decided that they'd said all they had to say. 'Last Curtain Call' is available as a DVD with a ten-track 'best of' the gig CD selected by the band, or a sixteen-track double CD. Or both, depending on how much Theatre Of Tragedy touched your life and how much you value to their contribution to the metal female voices genre.